NOTABLE LANDMARKS Three UNESCO World Heritage Sites: the Golden Gates, and the Assumption and St. Demetrius Cathedrals. 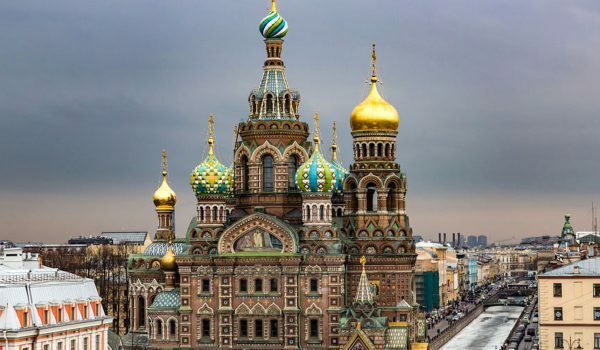 Moscow and St Petersburg are Russia’s showpiece destinations, but the Golden Ring of historic towns and cities, northeast of Moscow, offers a rewarding glimpse of provincial Russia’s charms, from the somnolent museum town of Suzdal to the Volga River port of Yaroslavl. Several towns here are former Russian capitals. This fertile land of forests and meadows gave birth to much of the cultural heritage which Russia celebrates anew in the post-Soviet era. Vladimir is one of the oldest Russian communities. It is located in the heart of the historic Vladimir Oblast (region), 180km (115 miles) northeast of Moscow on the bank of the Okayama River. The city was founded in either 990 or 1108, depending which historians you consult. For the better part of two centuries (from 1157 to mid 1300s) it was the capital of ancient Rus. For many tourists Vladimir is the jump off point on the way to visit beautiful Suzdal which is only 50 minutes away. However it is a fine historic town in its own right with some lovely old buildings and the famous Assumption Cathedral placed on the top of the hill overlooking the countryside. Constructed from white limestone, this was the largest and most important cathedral in ancient Rus and its design inspired that of the great cathedral within the Moscow Kremlin. The interior decoration of the Cathedral is important in Russian art. Most of the 12th-century frescoes were destroyed by Mongols in 1238, but new mural paintings were added in 1408 by the master painters Andrei Rublev and Daniil Chernii, in particular the famous Last Judgement . The iconostasis is a fine Baroque example of 1774. Until 1238 when Tatar Mongol Horde attacked Rus Vladimir was recognised in the Orthodox world as the most important city after Constantinople and Kiev. Unfortunately most of the city perished in a terrible fire and by the 14th century the growing city of Moscow became the capital of Rus and Vladimir became a backwater. Assumption Cathedral (Uspensky Sobor): Open 13:00 – 16:45. Closed Mondays. Golden Gates, the only surviving example of Russian medieval defensive architecture: Open 10:00 – 18:00. Closed Thursday. Bogolubsky Monastery in the village of Bogolubovo, about 20 minutes from Vladimir, is also noteworthy. If you want to visit this site it is additional to the sightseeing already included. For souvenirs look in the small market which is located close to the Golden Gates. In the basement of the Troitsky church is a small shop selling glassware from the local Gus Krustalny Factory. The prices are very competitive and the quality is very good. This is a long read, but we are in areas of Russia that have major historical significance and reach far back into the timelines of this fascinating area. The area around Vladimir City has been a site of human inhabitation for approximately 25,000 years. Traditionally, the founding of Vladimir has been acknowledged as 1108 when Vladimir Monomakh inherited the region as part of Rostov-Suzdal principality in the 12th century. More recently, a new view has emerged that the city is still older. The claim is that a certain Father Georgy possesses chronicle material that mentions the city in 990, associating it with Vladimir Sviatoslavovich (later St. Vladimir), the “father” of Russian Orthodoxy. Specialists still debate the issue.. Regardless of which foundation date is most accurate, the city’s most historically significant events occurred after the turn of the twelfth century. 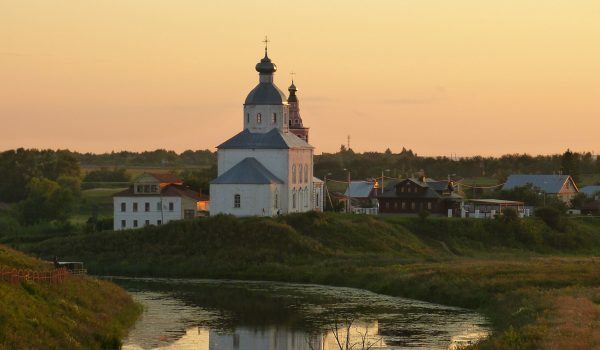 Serving its original purpose as a defensive outpost of the Rostov-Suzdal principality, Vladimir had little political or military influence throughout the region of Vladimir Monomakh (1113-1125), or his son Yuri Dolgoruky (1154-1157). However, Vladimir rose in significance after Prince Andrei Bogolubsky, son of Dolgoruky, transferred the throne from Suzdal to Vladimir, thus changing the name of the principality from Rostov-Suzdal to Vladimir-Suzdal in 1157. Under Princes Andrei Bogolubsky and Vsevolod III “Big Nest” (Bolshoye Gnezdo – so named because he had a large family), Vladimir grew significantly in power and importance, replacing Kiev as the capital of the Grand Principality of Rus in 1169. During this period the Golden Gates and Assumption Cathedral were constructed. During the reign of “Big Nest” the city experienced its most substantial growth. Prince Vsevolod preserved and added to the magnificence of the city. He constructed the Kremlin and the Cathedral of St. Demetrius; the Nativity monastery, including a white stone cathedral; the Princess Convent; and the most sacred church in the principality – the Assumption Cathedral. Following Prince Vsevolod’s death in 1212, the consolidated “state” (Rus) split into several smaller principalities. In 1238 Vladimir, like all of Rus, fell under Mongol-Tatar control. This limited the city’s ability to unify the multitude of royal thrones. Although the Mongol-Tatar occupation affected the authority of the Vladimir princes, the city’s role as the legitimate seat of Russian royalty was confirmed by the transfer of the Russian metropolitan from Kiev to Vladimir in 1299. Following this transfer of religious power, each successive grand prince of Rus was crowned in Vladimir until 1432. Beginning in the mid-14th century, Vladimir’s power was severely challenged by the rise of the Moscow principality, specifically under Prince Ivan Kalita. 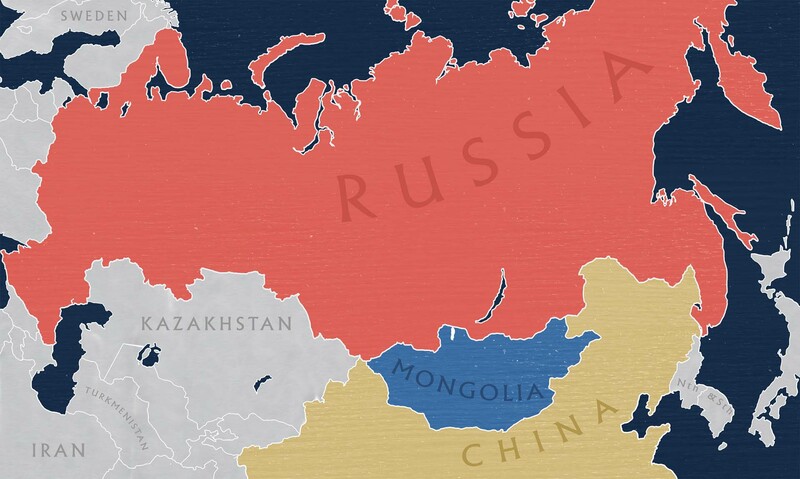 The consolidation of Moscow’s preeminence, coupled with the stifling effects of Mongol-Tatar occupation, ultimately extinguished Vladimir’s ability to flourish as a royal city. 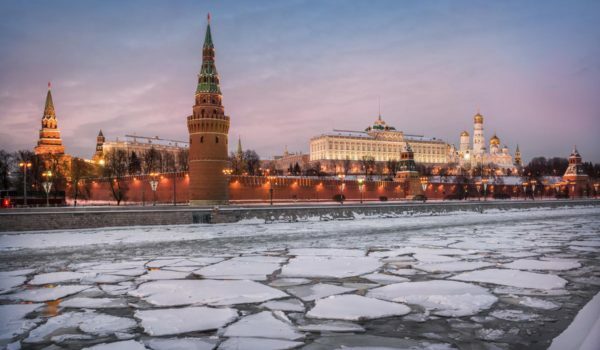 However, the exulted role the city played in the formation of the Russian State has assured continued recognition of Vladimir as a prime contributor to Russian politics, culture, and history. After the rise of Moscow, Vladimir was subordinated to the new capital, but the city continued to develop. At the turn of the 16th century, stone construction was resumed. This period is represented by one of the most poetic architectural creations: the Assumption Cathedral of the Princess Convent. In the 16th to 18th centuries, the city grew beyond the old boundaries as a number of settlements appeared around the old fortress. In the 17th century, the lovely Church of Our Lady was built. And in the 18th century, a large number of wooden parish churches were replaced by stone houses of worship. In 1778, the province of Vladimir was established, with the City of Vladimir as its administrative centre The development plan for 1781 envisaged the extension of the city’s territory, the symmetrical layout of the new districts, and the construction of secular stone buildings. Along the main street, Bolshaya Moskovskaya, the new construction included a building for the city administration (1785-90) and a number of privately owned stone houses. A whole block was taken up by what is still called “Gostiny Dvor” (the “trading row”). The small shops that sold late 18th / early 19th century items have, of course, been replaced by shops that sell everything from household appliances to souvenirs. But this section of Bolshaya Moskovskaya still reflects its centuries-old origins. During this same period, a post office was built near the Golden Gates. At the eastern edge of this district, a nursery home was constructed. Opposite the city administration building, the so-called Nobles’ Club was built, and nearby a classical school for boys. The Governor’s mansion was built near St. Demetrius Cathedral. Little by little, Vladimir was becoming a “solidly built” city-while not losing its historical profile. In 1838, the predecessor to today’s Moscow to Nizhny Novogorod highway was constructed. In 1860, the first city water system was installed. In 1861, the railway came through Vladimir. In 1887, the first telephones were installed. As the 19th gave way to the 20th century, a number of interesting buildings went up in Vladimir-and added to the city’s aesthetic appeal. These included the Church of the Archangel Michael (1893), the city bank (1896), the Historical Museum (1901), the Public Meeting House (1905), a technical high school (1907), a new City Hall (1907), and the Old Believer’s Trinity Church (1916). The latter now houses the Museum of Crystal, Lacquer Miniatures, and Embroidery. In the midst of all this construction, in 1909, the first electric power station was built. The 20th century greatly changed the face of Vladimir. In the 1930s the first industrial plants were built. After WW2, buses and trolley buses appeared on the city streets. They are joined today by “mini buses” that also travel fixed routes and taxi cabs-all competing with a growing number of private automobiles. Efforts are underway to route traffic away from the city’s historic centre. The city of Vladimir has grown in all directions. Today it is once again a regional capital, boasting two major universities, top-flight drama and puppet theatres, a major concert hall, and a host of talented performers, artists, and artisans. Culture is alive and well in this community with roots set deeply in ancient Rus. And the entrepreneurial spirit is also thriving – testified to by the growing number of private businesses, including first-class hotels, restaurants, and places of entertainment. As you examine the history of Vladimir, you will encounter fascinating stories and legends around almost every corner. These tales enrich the academic study of Russian history. In a journey through the rich history of Vladimir, truth and fiction mingle to create a magical impression of the city’s true grandeur and history. These very stories, regardless of their factual accuracy, which define this beautifully majestic city. In a journey through the extraordinary history of Vladimir, truth and fiction mingle to create a magical impression of grandeur and bewilderment.